Bring science class alive with these wonderful visual aids! These beautiful pictures will enhance your child’s understanding as he studies the world of science and God’s creation. 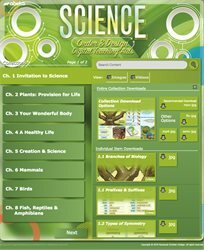 The digital aids correspond with the material presented in the text book and give your child a deeper appreciation for creation. Discover the plant world, take a closer look at the functions of the human body, and explore the animal kingdom with these pictures and videos. Digital Teaching Aids are broadly compatible with your favorite software that supports .mov, .mp3, and .flv file formats, whether you are running the software on a computer, tablet, or other mobile device. They can be projected using a smart board, screen, or television; or individual images can be printed on poster-sized charts for display.